Kathmandu , Lumbini, Pokhara and Chitwan National Park tour is one of the best overland tours to observe the culture,wildlife adventure, birth place of lord Buddha and natural beauties. Kathmandu is the city of culture. Chitwan National Park is the home of flora and fauna. Lumbini is the origin of the Buddhism which is expanding all over the world. Pokhara is the city of natural beauties where we can view the snow-capped mountain panoramic view, beautiful lakes like Phewa Lake and Begnash Lake. David’s fall is the really interesting waterfall in Pokhara. The caves are amazing. We have many different types of hotels like non-star to star and location in city area to Mountain. We provide the hotel on the requirements of guests and the cost also depends upon the category of hotel. We provide luxury coach on the requirements of guests. The coach depends upon the number of tourists. Our drivers are highly concern on the safety of guest. The cost of the package depends upon the number of Tourists and requirement of facalities. Day 01: Pick up from international airport and transfer to the hotel. Day 02: Early in the morning go to mountain flight to view the World highest Mount Everest as well hundreds of snow peaks. Then back to hotel and have breakfast. After breakfast start tour Bouddhanath world biggest stupa. Then drive to Pashupatinath which is the beautiful pagoda temple with hundreds of pilgrim each day. The Baghmati River is very popular and important for the cremation and tourist can view it. After sightseeing of pashupatinath drive to Bhaktpur the traditional city of Kathmandu. In Bhaktpur tourist can see the old royal palace with group of temples, Pottery square and hand crafts. Then drive back to hotel. Day 03: After breakfast drive to pokhara and lunch is provided on the way in a beautiful restaurant. The whole road almost passes along the mountain and just down of the road people can view the beautiful rivers. And first day we do boating in Phewa Lake. Day 04: Early in the morning drive to sarangkot to sun rise and beautiful snow mountain and drive back to hotel. After breakfast start sightseeing and visit Binde basini temple, Devid’s fall, gupteshor mahadev cave and Tibetan refugee camp. Day 05: Drive to chitwan National Park and relax in Rapati river to view the sunset with dense forest. Day 06: After breakfast start jungle activities. In Chitwan national park the following activities are included. Canoeing trip, Jungle walk, Elephant riding, bird watching, Tour to elephant breeding center,Tharu village tour, Thau village and Tharu museum tour and culture program. Day 07: After breakfast drive to Lumbini the birth place of Lord Buddha. After four hours drive we arrive to Lumbini. Get fresh in the hotel and look around to see different types of Monastries. Day 08: After breakfast visit the footprint of Buddha and Ashoka pillar and the pond where the Buddha was given first bath. Then back to Hotel and drive to Kathmandu. At evening farewell dinner is provided with culture program. 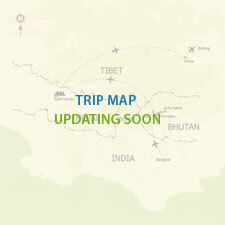 Day 09: Drive to international airport and fly onwards destination.